MP IGP Manish Shanker Sharma honoured with the prestigious "National Law Day Award 2016"
IGP Manish Shanker Sharma receiving "National Law Day Award 2016"
Adding one more feather in cap, Madhya Pradesh IGP Manish Shanker Sharma was awarded the "National Law Day Award 2016" in the field of Law and Order. 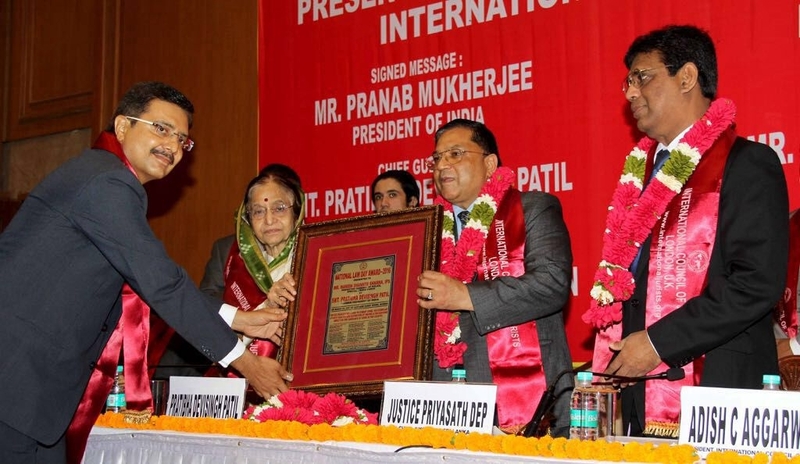 The award was given by the former President of India Mrs Pratibha Devi Singh Patil and the Chief Justice of Sri Lanka, Honorable Justice Priyasath Dep at the inaugural ceremony of "International Conference of Jurists". The event was jointly organized by The International Council of Jurists, London; All India Bar Association and Indian Council of Jurists at the Mumbai on March 25, 2017. The award was conferred on IGP, Manish Shanker Sharma for his outstanding contribution and fearless measures to combat crime in the field of counter terrorism strategies and tactics, generating discourse in presrtigious universities like Manipal University, Aligarh Muslim University and many others universities on National Security and also his exemplary efforts that have earned distinction by making a far reaching impact in the landscape of crime and counter terrorism in the country and abroad. Apart from his admirable work on counter terrorism strategies and tactics, IGP Manish Shanker Sharma has tirelessly worked to enhance US-India relationship, for which Mayor of the City of San Diego, California (USA) has proclaimed July 20, 2015, as "Manish S Sharma Day" to honor his contribution. His other accolades include the certificate of special congressional recognition from US House of Representatives; many awards and medals from Govt. of India, Govt. of USA , Govt.of Bosnia & Herzegovina and the United Nations Peace Medal.